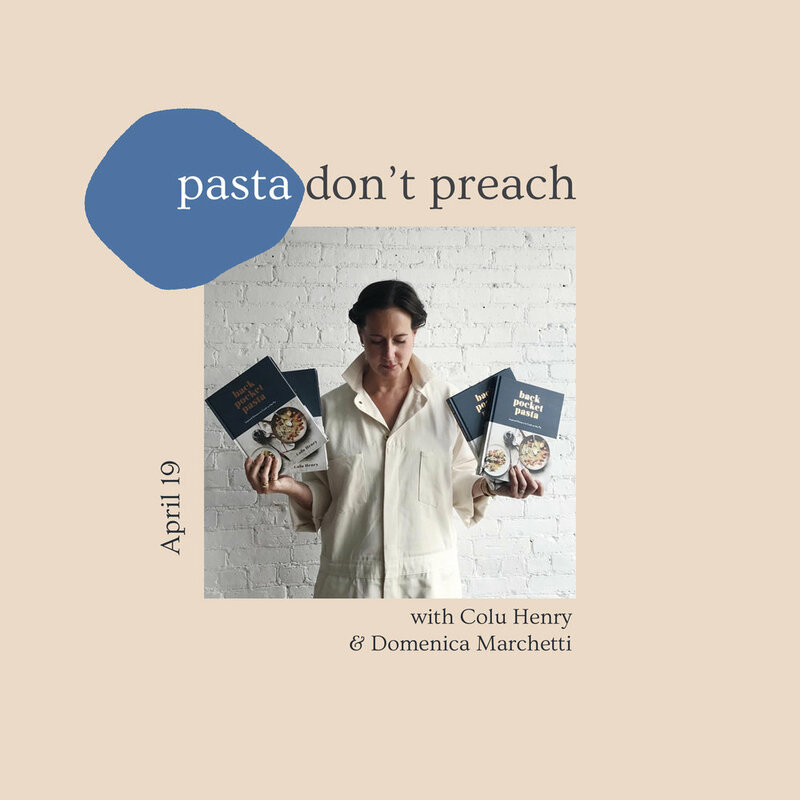 Have you ever considered a 100% pasta lifestyle?Join us for an evening with Colu Henry, author of Back Pocket Pasta, in convo with Domenica Marchetti, author of The Glorious Pasta of Italy. Together they’ll explore the mouthwatering range of pastas plus the role of women in the history of pasta making and today’s celeb chef culture. No matter how you sauce it, this convo will go far beyond inviting your girlfriends over for spaghetti night (though, that’s pretty cool too!). Come get your Julia child on with mother-daugher duo behind French cooking school @thecooksatelier Marjorie, Kendall in convo w Amanda Mack (@mrsmarriedmack), a Baltimore-based chef with a pioneering, intergenerational food history of her own 💕we’ll hear about what it’s really like to teach cooking, start a family biz, and work with a network of local food artisans ✨plus mes chéris, we’ll also feast on some French-inspired food, courtesy of @trycaviardc, sparkling @topochicousa mineral water all at @shopmadeindc. Bon appetit! For illustrator Jessie Kanelos Weiner, a.k.a. @thefrancofly, food and art go hand in hand. Join us for a convo with Jessie & Ann Mah, DC- and Paris-based journalist where they’ll dish on life in Paris and the creative process; a watercolor workshop using woman-made food products as our still-life muses; and local noms from Each Peach Market. So grab your beret and get your creative juices flowing with us. When it comes to wine, we have some questions...like, How do we know which wines to drink? What are my go-to wines for when I am hosting friends? If we’re looking for the “natural wines” in our city, where can we even find them?! Answers to these questions and more are in "Wine. All The Time. ", a gem of a guidebook to casual & confident drinking by Marissa Ross, who also happens to be Bon Appetit Magazine’s wine editor (nbd) and our personal wine hero. Why? Because she’s f***ing funny and is the poster child of approachable wine sippin’. Join us for the best Friday night of our lives with Marissa and our moderator, Julia Coney, one of our fave DC-based wine writers & wine enthusiasts. 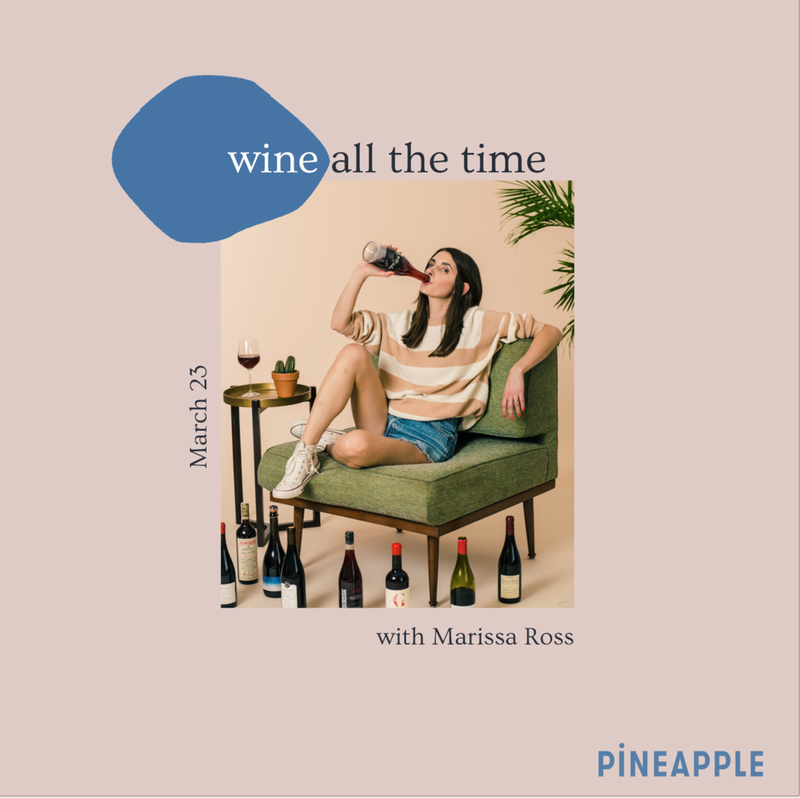 From why natural and organic wines are a thing to picking wines to impress at dinner parties to why rosé is best paired with Drake, all your questions will be answered IRL. Plus, there’ll be a delicious dinner in collab with Caviar, an epic wine tasting led by Marissa in collab with our wine distributor friends Tenth Harvest, and Native Selections, and ample opportunities for the #rosstest--all nourished by OneTable Shabbat. We’ll cheers to that. Bumble ** Bumble empowers users to connect with confidence whether dating, networking, or meeting friends online, making it not only necessary but acceptable for women to make the first move... wink wink. As women who love food, we must look beyond our plates and favorite restaurants and also feed our food system awareness and activism. Food Justice underpins food issues, and so we must educate ourselves about food’s connection to our community’s health, prosperity and wellbeing. 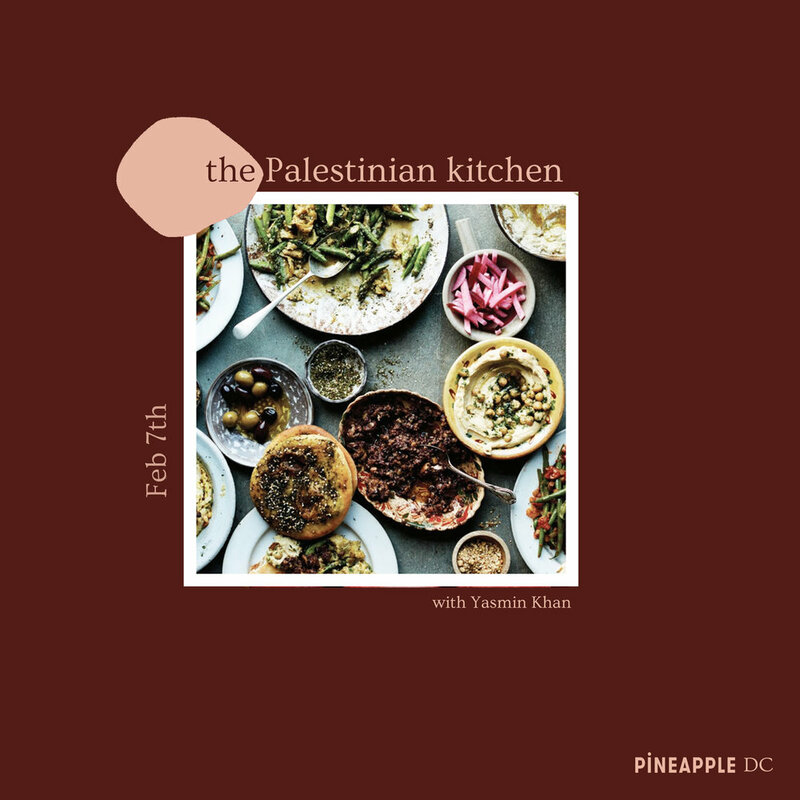 Join pineapple to explore how we can create a more just food society in DC and beyond. Our panel will lead us in examining questions, such as: what can we- a community of women who are passionate about food- do to create a more equitable foodscape? What does Food Justice even mean? What kind of policies do we want to get behind in legislation? And will they move the needle on Food Justice? Together, let’s discuss what we want to see changed locally and how we as consumers, citizens and activists can incorporate equity and opportunity into our purchasing, work, and voting. This is not your average conversation about Mexican food & drink. This is a conversation and a tasting showcasing how a single tortilla and a sip of mezcal are a reflection of agricultural biodiversity, sustainability and independent farmers. Our pals at the Southern Mexican restaurant & bar Espita Mezcaleria and heirloom corn and tortilla company Masienda know a thing or two about the deliciousness of masa* (dough made from corn flour) and mezcal**...and beyond that, their immeasurable historical, cultural and biological value in Mexico. Join us for an evening with the women of Espita--Kelly Phillips--co-owner, Megan Barnes--Beverage Director and co-owner, and Yesenia Neri Diaz--masa cook--and Danielle Dahlin, VP of Operations (a.k.a. the woman who manages Masienda’s supply chain - from farm to tortilla) at Masienda. We’ll chat the ins-and-outs of sourcing, the heritage of hand-crafted food & bev, and how Mexican women in Mexico and America power these supply chains. “Food freedom” is about living in harmony with the food around us. We’re obsessed with food. But when is that obsession just too much? As women sometimes our relationship status with food is “it’s complicated”. We ask questions, like “How will eating this food make me look?” and “How will eating this food make me feel?” We think about food when we’re not eating--planning meals, scrolling through Instagram and perhaps feeling excluded, or criticizing ourselves for something we ate or didn’t eat in the past. We probably don’t have to tell you that food can be wrapped up in some challenging emotions, like shame, guilt, exclusion, or obsession. What we’re striving for is to turn these negative emotions in positive ones and use food as a source of joy, nourishment, intention and community. 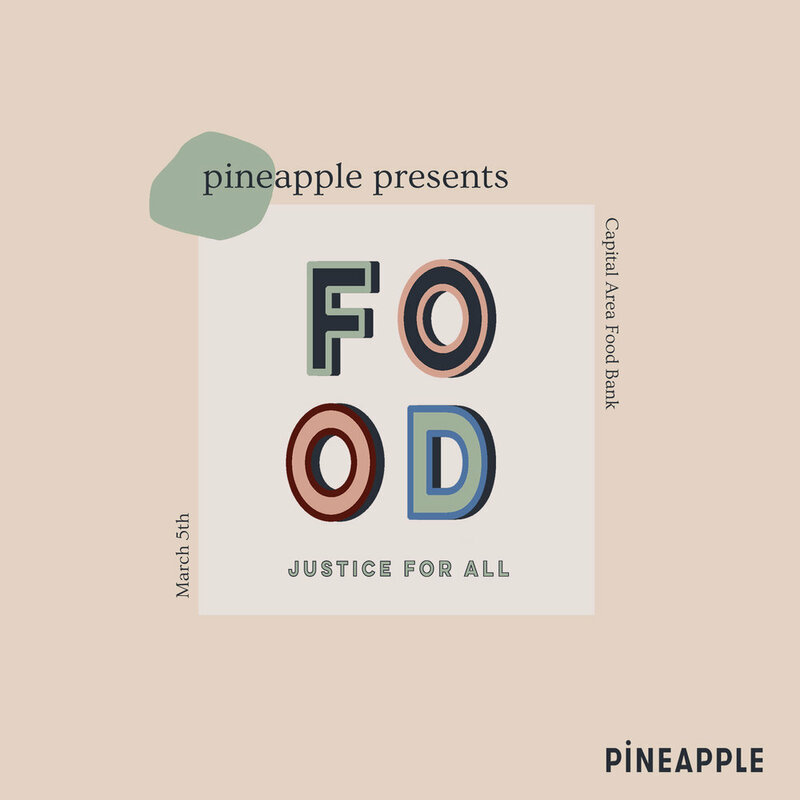 Join pineapple for an interactive evening of “food freedom” with 4 women we admire in wellness--Jennifer Sterling of Black Girl Healing Project, Joanna Andreae of Wandering Wellness, Samantha Attard of Happy Healthy Human, and Lina Salazar of Live Well --to have an open conversation about our identities with food together. We’ll explore our emotions, actions and desires RE eating and drinking and meditate set intentions together to summon whatever habits or mindsets we seek. Join us in making friends with each other & our bodies during a panel discussion and breakout sessions. Alison Roman is on a mission to make us better home cooks & entertainers and we’re not mad about it. As a bestselling cookbook author and former Senior Food Editor at Bon Appetit Magazine, she’s all about how dining in can bring us just as much (if not, more) joy as eating out, create more accessibility around good food and most of all, build lasting friendships and community. Her philosophy is grounded in building flavor and saving time. Her book guides us through her favorite condiments, pantry essentials, why your fridge should always be stocked with boiled potatoes and is full of useful recipes (that are actually fun to read!) for everything from morning-after-salad to that cookie (salted butter chocolate chunk shortbread!) everybody’s Instagramming. Join us for a highly cookable evening where as expert or aspiring home cooks, we’ll ask important questions like “why is Alison always asking us to toast our nuts?” We’ll explore the ease of cooking and Alison’s career from Milk Bar pastry chef to acclaimed author with our moderator Melissa Jones, edible activist and founder of FoodTalksDC. Dining In books available for purchase in advance and at the event! The Event Space at 880 P St NW ~ 880 P is Shaw's newest luxury residences at City Market at O. 880 P stands above the rest with 360 degree rooftop views and brilliant signature services and amenities from a private music lounge to a demo kitchen. Comida latina is a journey through the rich diversity of Latin American cuisines & cultures. Comida latina is about cooking with ties to family traditions, the Spanish language, and the collective use of corn. Comida latina is ever evolving—influenced by native and migrant populations from Europe to Asia to Africa to the Middle East and with each new generation innovating on what they learned from their ancestors. DC is lucky to have restaurants representing almost the entire span of Latin American cuisine and diners everywhere crave their diverse and authentic flavors, ingredients and dishes. Moreover, many of our favorite superfoods originate in Latin America: quinoa, maca, chia…even avocados. Despite this influence and these contributions in the US, the stories of the women who cook and lead businesses rooted in comida latina are under-represented in our media. Join pineapple for a conversation with leading ladies in this space exploring the multiple dimensions of comida latina with a particular focus on Mexican, Venezuelan, Cuban and Colombian food. Moderated by Katalina Mayorga of El Camino Travel and featuring Joahna Hernandez of Manos de Maiz, Gabriela Febres of Arepa Zone, Daniella Senior of Colada Shop and Marcella Kriebel of her books Comida Latina & Comida Cubana, we’ll use food as a gateway to connect with and better understand this vast region representing so many different countries, cultures and cuisines. What do masterful storytelling, world-renowned female chefs and progressive agriculture all have in common? Abby Fuller (@abrafever), an award-winning documentarian and the youngest and only female director of our fave Netflix show Chef’s Table. From Chef Ana Roš’ kitchen in Slovenia to a regenerative cattle farm in Virginia, Abby highlights critical issues in our food system by filming the most highly acclaimed chefs, farmers and activists who are changing the way we eat. While Abby is currently filming an episode of Chef’s Table season 4 with a yet-to-be-revealed, revolutionary female chef, she recently made the move from LA to an 800-acre regenerative farm in rural Virginia (called Another Perfect Day) to showcase the power of this type of farming to transform our soil, environment, and planet. 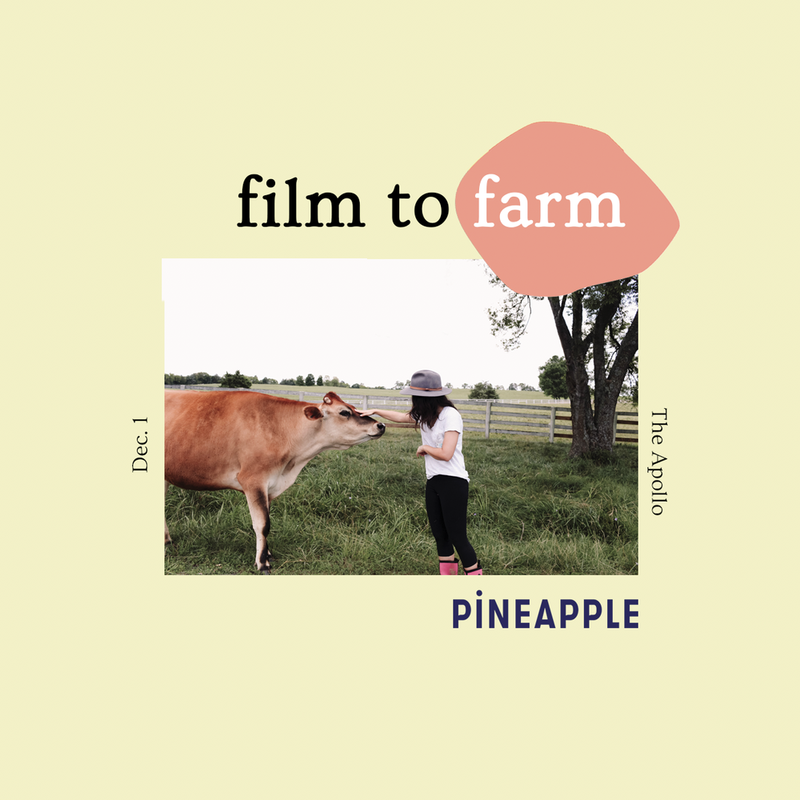 Join pineapple in conversation with Abby and moderated by photographer & creative director Kate Warren (@gokateshoot) to explore how women are transforming filmmaking, farming and food. While viewing clips from her episode, we’ll enjoy dinner made by Chef Johanna Hellrigl, including sliders and a ‘grazing greens’ salad using Another Perfect Day’s meat & produce, and Dio natural, women-made wine throughout the evening. Pine for Wine: Yes We Can! *limited edition* canned wine & ‘za. wine not? Because you don’t always need to drink wine with your pinky up! Join us for the launch of Old Westminster Winery’s WINES IN A CAN - the first women-made, natural wine product of its kind grown and canned here in the Mid-Atlantic. We’ll have a tasting of three limited-release wines--Carbonic, a semi-carbonated cabernet franc; the Farmer Fizz, a sparkling home-vineyard chardonnay; and Seeds & Skins, a partially skin-fermented pinot grigio. Why cans over cork? Join us as we hear from the sisters behind it all-- Lisa Hinton, head winemaker, and Ashli Johnson, Director of Marketing--about why they’re making single-site, Maryland-grown, no makeup kind of wines that are brighter, fresher styles meant to be enjoyed, not cellared. And to boot, we’re pairing each wine with a different pizza from women-owned and Bon Appetit Top 50 Hot List winner Timber Pizza Company provided by Caviar - because you know... canned wine and delivery are the perfect pairing. Calling all herbal enthusiasts! The next wave of wellness and feminism is edibles entrepreneurship. In DC and around the country, women are leading a “greenrush” of new cannabis-based businesses and transforming the plant into delicious, healthy and universal products. Though 29 states have legalized cannabis either medically or recreationally, including DC, there’s still a social stigma and misunderstanding about the science and regulation holding cannabis back. At the same time, both entrepreneurs and consumers are demanding higher standards when it comes to their edibles experience. Ali Francis, Baking Supply Co.
pineapple x Salt & Sundry present: Cherry Bombe’s DC Bombesquad! Cherry Bombe Magazine, Radio Cherry Bombe and now Cherry Bombe: The Cookbook have led the way telling the stories of incredible women in food throughout the country and in the process, have given us all a Bombesquad. 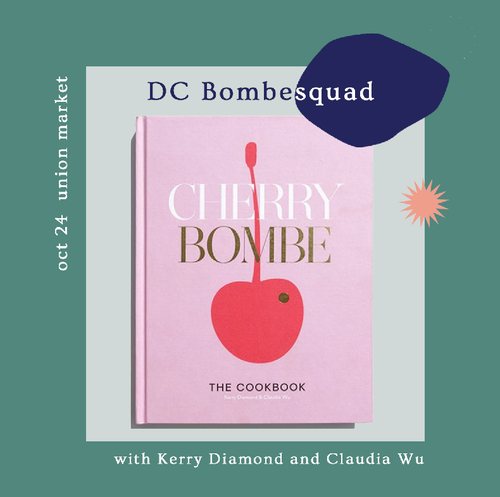 We #pinefor all things Cherry Bombe and are thrilled to welcome Editor-in-Chief Kerry Diamond and Claudia Wu for Cherry Bombe’s first DC appearance! Their just-released cookbook features the food world's most interesting bakers, chefs, food stylists, photographers and pastry chefs and their most meaningful recipes. To celebrate, we’re bringing together a panel of some our favorite DC-area leading food ladies, held at Union Market- epicenter of DC food innovation, to discuss DC’s food scene, being a woman in food and the importance of having your Bombesquad. We don't have to tell you that the entrepreneurial women in food deliver on innovation and so much more. When we look at the grocery world, we're excited to see a growing number of delicious, healthful and women-made products to #pinefor. Join us in conversation with online grocer FreshDirect, which just launched delivery in DC, featuring four NY-based women behind some of our fave foods: Anita Shepherd of Anita's Yogurt, Nekisia Davis from Early Bird Foods, Chloe Epstein of Chloe's Fruit and Vanessa Dew of Health-Ade Kombucha. FreshDirect Food Merchant Marissa Dobbins will highlight how these women have grown their companies from good ideas to craveable, nationally distributed products, and why FreshDirect chooses to carry them. Whether you're growing your own food empire or want to learn more about the stories behind your favorite brands, this event will deliver deliciousness (including products from these companies & FreshDirect to take home to stock your fridges and pantries). Call her the ice cream mogul or the dairy queen, but Jeni Britton Bauer, founder of Jeni’s Splendid Ice Creams, is the woman behind America’s obsession with better ice cream and has been for two decades. We had the honor of hosting Jeni to celebrate Jeni’s first DC shop on 14th St NW, which is location #32 in her ice cream empire. Holley Simmons, Washington Post contributor and co-founder of The Lemon Collective and Sill Life, interviewed Jeni IRL to uncover her ice cream journey--from art school dropout and former perfumer to the visionary food leader we #pinefor today. We socialized and enjoyed scoops from Jeni’s Ice Cream Truck, which was parked at Union Market exclusively for pineapple ! check out our interview with Jeni, here! inspired by Bon Appetit magazine's spotlight on Food in America, we celebrated the diverse culinary traditions found in the kitchens and homes across the country. in partnership with Sally’s Middle Name, we hosted our third event in our series, featuring Đôi Đũa, a pop-up market experience serving classic Vietnamese-style food with a modern twist. For Phoebe Lapine, healthy hedonism is a thing. Why? Because we all want to feel good in our bodies and minds while still enjoying the sweet parts of life. Author of the new book, The Wellness Project, Phoebe has lived by this motto ever since her diagnoses with an autoimmune disease in her early twenties. overwhelmed by the countless and often conflicting advice to improve her health, Phoebe decided to take her wellbeing into her own hands and write a guide not only she could follow, but also inspire others to do the same. 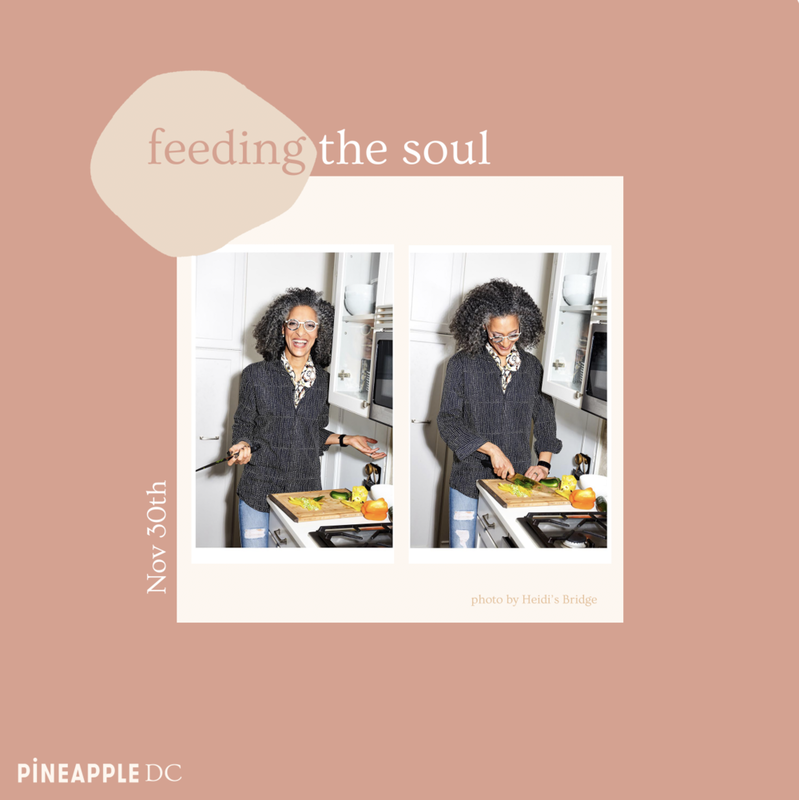 This event featured a conversation with Phoebe, moderated by pineapple DC member Carlene Thomas, Virginia-based dietitian nutritionist, recipe developer, and co-owner of Healthfully Ever After (@healthfullyeverafter).We explored the term “wellness” and how it plays into our lives, deconstructing the notion that we have to sacrifice our culinary comforts for a healthy lifestyle. 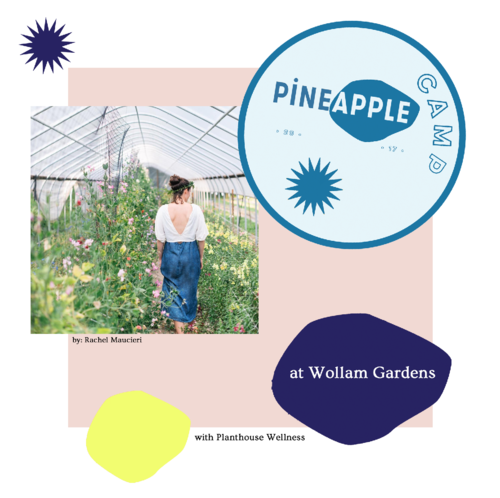 What do a flower farm, wellness workshops, yoga, pineapple swag, and plant-based brekkie & lunch all have in common? PINEAPPLE CAMP, THAT'S WHAT. We escaped the city and join us for a full day of fun, relaxation and inspiration at Wollam Gardens, a beautiful flower farm in the Virginia countryside, only one hour outside of DC; featuring a stellar line-up of all the "camp" activities we #pinefor plus a choice of 2 workshops led by local DC health, wellness, and self-care experts.